9 August 2010, at 8:24a.m. US - The 2010 Production and Health Seminar will take as its theme, 'New Era of Antibiotic Use'. Antibiotic use in the poultry industry has been under widespread scrutiny and will be a key topic at the 2010 Poultry Production & Health Seminar. Sponsored by US Poultry & Egg Association's Poultry & Egg Institute, the annual conference will be held on 21 to 22 September at the Peabody Hotel in Memphis. "Antibiotics play an important role in maintaining healthy birds," said programme chairman, Frank Halpin of Pilgrim's Pride Corporation. "The United States Department of Agriculture is questioning the use of antibiotics in animal agriculture, suggesting that they may cause antimicrobial resistance. This year's seminar will examine the impact proposed restrictions will have on live production, and the challenges live production managers and service representatives may face in the future." Additional topics on the programme include the latest ideas and innovations in lighting programmes to enhance performance, Salmonella standards for live production; litter management; vaccination programmes; and other relevant topics to help maintain healthy flocks. To register for the Poultry Production & Health Seminar, click here. 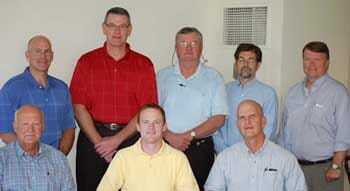 A programme committee of live production managers and poultry health professionals developed the agenda for the seminar, including (seated from left): Henry Welch (Peco Foods), Mark Burleson (Sanderson Farms) and Frank Halpin; (standing from left): Robert Crowe (Harrison Poultry), Sam LeNarz (Wayne Farms), Larry Gandy (Marshall Durbin), Dr John Smith (Fieldale Farms) and Dr Casey Ritz (University of Georgia).